Should You Let Your Neighbor Borrow That? A Geographic Information System (GIS) is a tool that creates visual representations of data and performs spatial analyses in order to make informed decisions. It is a technology that combines hardware, software, and data. The data can represent almost anything imaginable so long as it has a geographic component. The hardware can be anything from a desktop computer or laptop to satellites, drones, and handheld GPS units. There are a few different software packages, but ESRI’s ArcGIS suite is the industry standard. The public, private, and non-profit sectors all employ GIS to do everything from manage public utilities to organize the movement and dispersion of goods and services. GIS is very functional in traditional map making, to plot things like fire hydrants along a road, or to draw boundaries, like the area of different crop fields on a farm. The real power of GIS, though, lies in its ability to analyze multiple data layers or variables. 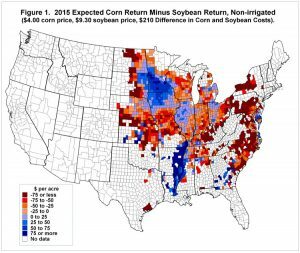 Simple examples of this within the realm of agriculture would be; a map showing the number of farm injuries by county, or the number of crop acres lost to flood by tax map parcel. The polygons representing different ownership or municipalities can convey the change in values in different ways, the most common being a changing color ramp. More complex spatial analyses for agriculture might compare variables like soil type, wind direction, rainfall amount, slope, aspect, topography, or elevation to assist with crop management, site suitability, and drainage planning, as well as risk prevention from flood, drought, erosion, and disease. GIS can help a farmer adapt to these different variables, monitor the health of individual crops, estimate yields from a given field, and maximize crop production. There are many sources for GIS data free of charge and also for a fee. Universities, government agencies, and private companies are all repositories of spatial data. The New York State government hosts a GIS clearinghouse with a great variety of datasets, some available to the public and some to clearinghouse members only. Some of these data include addresses, watersheds, aerial photography, municipal boundaries, district boundaries, tax map parcels, and road networks. Another GIS-based resource available for free to the public is the USDA’s CropScape, an interactive web-based mapping application which shows the type, quantity, and location of crops growing across the country. By using land-use and primary food crop statistics, along with data collected by satellites and mobile devices to identify areas in need and underlying causes of food insecurity, GIS is also instrumental in the efforts to end global hunger. Satellites, drones, and manned aircraft are used for remote sensing, which is the gathering of information about the earth’s surface by scanning it from high altitudes. The Landsat 8, a joint effort of the USGS and NASA, is an observation satellite which orbits the earth every 16 days. It captures 9 bands of the visible light spectrum which can be used to calculate factors like plant disease, nutrient deficiencies, insect infestation, or crop moisture excess and shortage. It also captures thermal infrared radiation (TIR) which is outside the range of human vision. Depending on the surface temperature, the intensity of the wavelengths emitted by different types of vegetation and various manmade and natural landscapes differs. The recorded data is converted to visible digital imagery and can be applied to general objectives like managing water for irrigation consumption or plant disease detection. It can also be applied to very specific objectives like evaluating the maturity of fruits. The aerial and TIR imagery captured by remote sensing are widely used layers in a GIS, and the data collected by the Landsat 8 is made available to the public for free. Higher resolution imagery is collected by low altitude aircraft which make flights over longer cycles ranging between 3 and 10 years. The Farm Service Agency, a department of the USDA, conducts a few such programs. One of the greatest benefits of remote sensing is that it is non-invasive and does not negatively impact the area which is being observed. 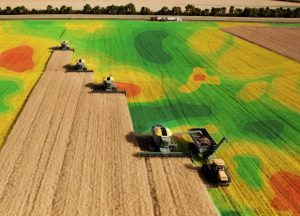 With the rapid developments in GPS, unmanned aerial vehicles (UAV), and robotics technologies, many farm tasks are becoming computerized. 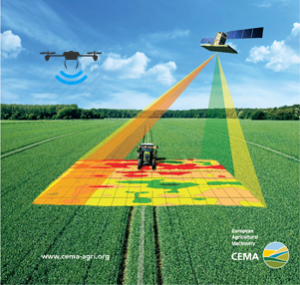 GIS is an integral part of automated field operations, also referred to as precision agriculture or satellite farming. Using data collected from remote sensors, and also from sensors mounted directly on farm machinery, farmers have improved decision-making capabilities for planning their cultivation to maximize yields. Previous crop yields, terrain specifics, organic matter content, pH, moisture, and nutrient levels of the soil all aid in proper preparation for precise farming. Combine harvesters equipped with GPS tracking units can measure crop yields along with crop quality values like plant water content and chlorophyll levels in real time and at the exact location in the field from which they are harvested. Variable rate technology (VRT) is the component of precision agriculture, which really enables the data to be put directly to use. It joins farm machinery, control systems, and application equipment to apply precise amounts of growing inputs at exact times or locations. Precision farming with VRT has both economic and environmental advantages. Applying seed, fertilizer, nutrients, or pesticides only where and when they are needed can have a substantial cost savings for the farmer and boost revenues. Additionally, negative environmental impacts from over application of some chemicals are alleviated, and the use of certain chemicals could potentially be eliminated entirely based on data analysis. Persistent dilemmas like nitrogen application can also be addressed, helping the farmer find the right amount between excessive and insufficient. Once a system is in place, a precision agriculture operation follows a closed loop cycle that would look something like: collect/analyze data, plan the harvest, apply the plan, and analyze the results for the following season. GIS has thousands of applications. It is an ever-growing field, which is already heavily integrated into many sectors of the government at all levels, as well as many types of private businesses. It continues to make innovations which benefit our everyday lives. Kyle Dornich joined NYCAMH/NEC in December 2017 as a Research Assistant. He will initially be working on two research teams, the Maine Logging Workers Health & Safety Study; and the Agricultural, Forestry & Fishing Traumatic Injury Surveillance Project. If you have any questions or interest in NYCAMH’s services please contact us by phone at (800) 343-7527 or by email at info@nycamh.org. NYCAMH is a department of Bassett Healthcare Network and our mission is to enhance agricultural and rural health by preventing and treating occupational injury and illness. i am really impressed for knowing a little about gis application on agriculture.I will be pleased to learn more from your university since i an agriculturist by profession and a GIS student at kwame nkrumah university of science and technology.Please if you can assist me in any form to come and continue my learning there too, i will be appreciated.thanks. I want to translate a book about gis in agricultur in persian. Can you help me? I would recommend reaching out to NYCAMH with questions or interest in NYCAMH’s services. You can contact them by phone at (800) 343-7527 or by email at info@nycamh.org. Terry Tucker,Associate Director of International programs at Cornell College of Agriculture and Life Sciences,607-255-3391or twt2@cornell.edu.